As an online seller, your ultimate goal is to attract new buyers at a manageable cost. You can tweet and pin away for traffic — but you can also catch real customers by getting your product before shoppers right when they need it. Being the largest search engine in terms of traffic, Google is a great platform to make buyers aware of your product at the moment when their interest is at its peak. 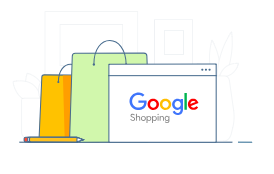 In this article, we’ll take an in-depth look at what Google Shopping is, how it works and how you can use it to drive your sales. Google Shopping is a dedicated shopping search engine from Google. Shoppers can use it to search for products for sale from online merchants. These search results also show up in the form of image ads in regular search when someone searches for a product. This makes it easy for shoppers to compare offers from different vendors. Notice the Shopping tab next to Images right below the search box? Clicking it will take you the dedicated Google Shopping search at Google.com/shopping. If you click any of the search results, you’ll be taken directly to the merchant site. Google Shopping is paid search. 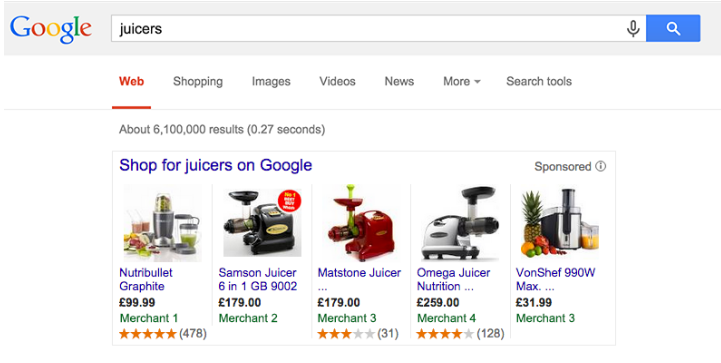 Unlike regular search, there are no organic results in Google Shopping. Every product you see was paid for by an advertiser to show up for that query. Retailers list their products on Google Shopping to show up on search results. In fact, they have the option to upload their entire inventory and start shopping campaigns so that the right product is shown to the right buyer. Google promises that putting up your products on its platform makes the world your storefront. This enhanced visibility gives you access to millions of customers. 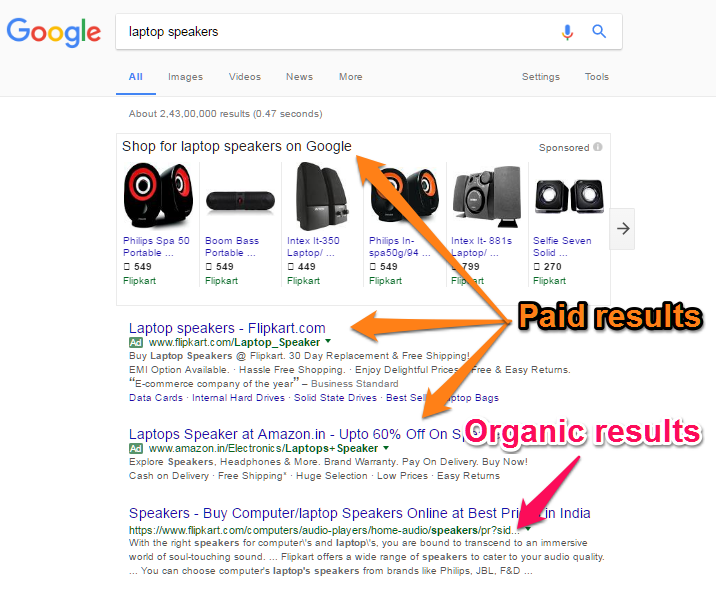 Earlier, Google used to have organic listings in its shopping results. However, Google has now switched to a purely paid model. Like AdWords, you will have to pay for each click to your store. But Google Shopping is more than just targeted traffic to your store. Google also offers retailers ways to manage listings and generate demand where they need it. Listing management. 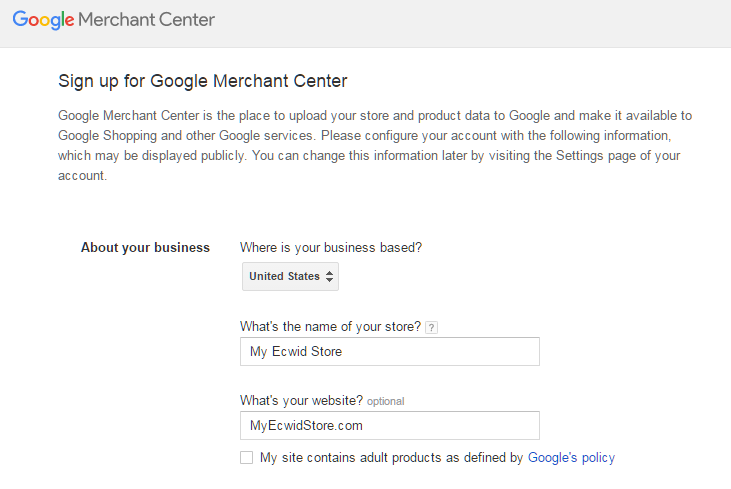 Use Google’s Merchant Center to upload your products and manage your listings. Local inventory ads: if you have a physical store as well, you can show up your product for local searches and generate footfalls to your store. Store ratings: Google offers stores with strong reviews a Trusted Store rating. This can greatly increase conversions. Payment and delivery: Google also offers qualifying stores payment option via Android Pay and delivery via Google Express. Advertising: This is the core Google Shopping service — advertising for selected listings on your target queries. 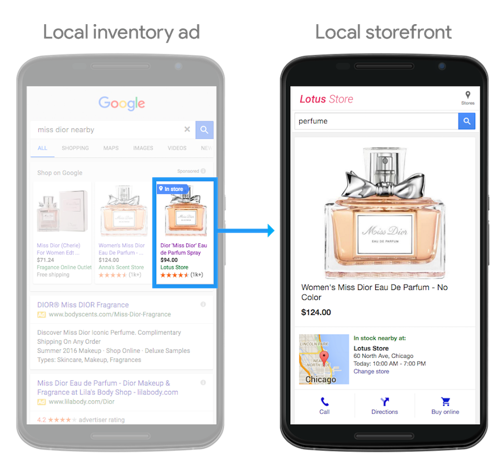 Google offers dynamic retargeting to show your ads across the web (and not just on target queries). You can see all these services on Google Retail. Google handles over 90 billion search queries every month. A top listing for this keyword can drive thousands of targeted visitors to your store. The top organic result (i.e. non-paid pages) in SERPs has an average CTR of 31%. The second and third results get around 14% and 9% of the clicks respectively. However, since the Google Shopping results are displayed before organic results, they get a bulk of clicks for a query. The visual nature of the results (i.e. they include product images) and actual prices/offers further increases the CTR. In fact, for most popular product queries, you can’t even see any organic results above the fold. If you want targeted traffic from product queries, you will have to advertise on Google Shopping. As an online seller, you don’t want any kind of traffic; you want traffic that actually buys from you. Simply inflating pageviews won’t do you any good. You want visitors who are actively searching for a product you’re selling. This is what makes Google Shopping so attractive for e-commerce stores. When a shopper searches for Bluetooth speakers under $100, he isn’t doing it for casual browsing. The exact nature of the search means that he is actively looking for Bluetooth speakers that cost under $100. Advertising on Google Shopping gives you access to far more targeted traffic than any other medium. You don’t have to invest in building up demand for your product (what marketers call demand generation). You can simply advertise and have wallet-out shoppers at your store. Google Shopping isn’t for everyone. There are a few situations where you might not want to use it. Your product or product category has high search volume. Use the AdWords keyword planner to calculate this volume. You have a conversion-focused design. Since you’ll be paying to advertise on Google Shopping, it’s important that you have a well-optimized landing page to convert shoppers into visitors. Else you might get a lot of traffic but not enough sales. You need to generate demand for your product. This usually happens in innovative, category-defying products where you need to first demonstrate your product’s value before selling it. You have a lot of competition. If there are tons of advertisers already on Google Shopping, you might find it unprofitable to buy ad space. This also applies if there are large brand name advertisers among your competitors (say, Nike.com advertising for buy Nike shoes). You can’t compete on price. 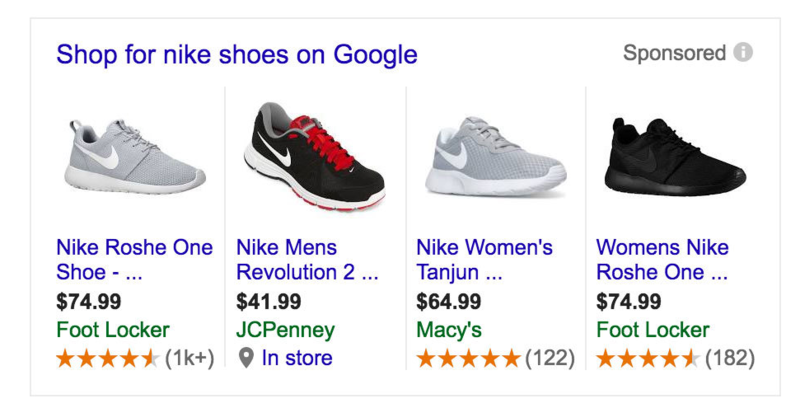 In case you are reselling others’ products (such as a store selling Nike and Adidas shoes), you should be able to compete on price to get traffic from Google Shopping. In short, Google Shopping works wonderfully well for products that have proven demand, a lot of searches with commercial intent and landing pages that support conversions. In this section, we’ll explain how to advertise on Google Shopping manually. 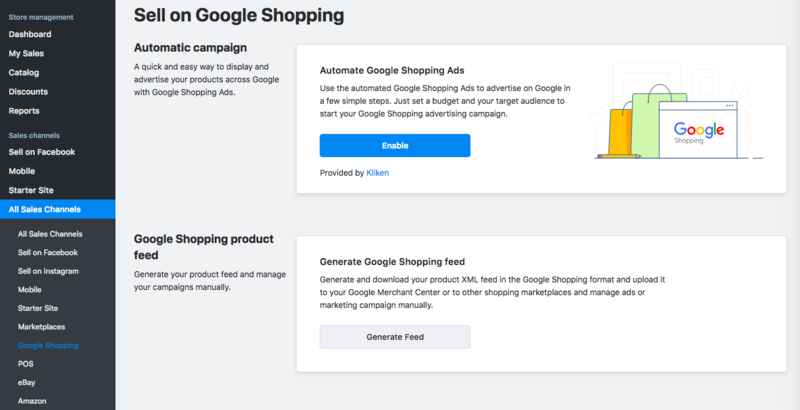 If you sell online with Ecwid, there’s a way for you to automate your Google Shopping Ads. Go to your Control panel and launch your first campaign in three simple steps. The smart algorithm will even optimize the campaign for you so that you get better results at a lower cost. Or, use the instruction below to figure out the manual way. Start by signing up for Google’s Merchant Center. This will enable you to manage your listings and upload your products manually should you choose to. You’ll have to enter your website URL, your store name and your country of operation. After entering these details, Google will ask you to upload a file to your server to verify site ownership. Once you’re done, you can log into the Merchant Center. Here, you can add and manage listings, update your business information and change tax/shipping details. Listings in the Merchant Center are grouped under Feeds. A store might have multiple feeds, say, a feed for your regular products, another for seasonal products, and one more for products sold in another country, etc. 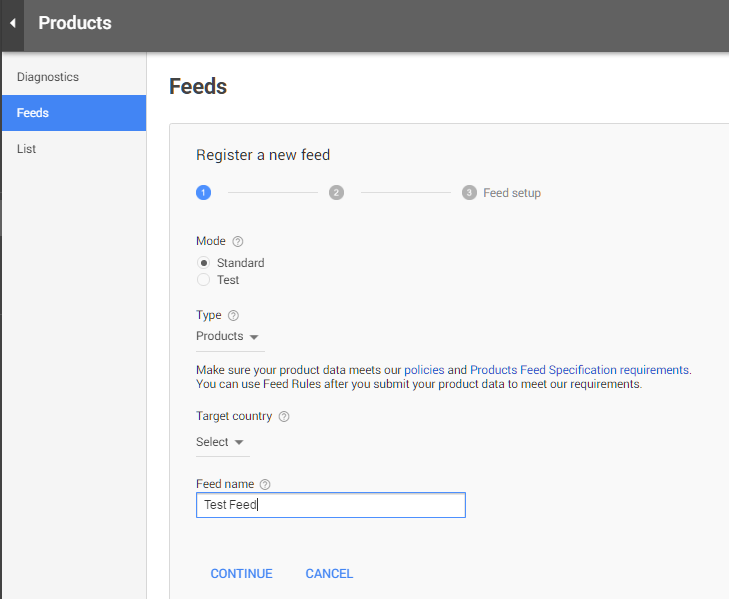 In order to add a feed, go to Products → Feeds in the Merchant Center. You can give your feed a name and select the country. 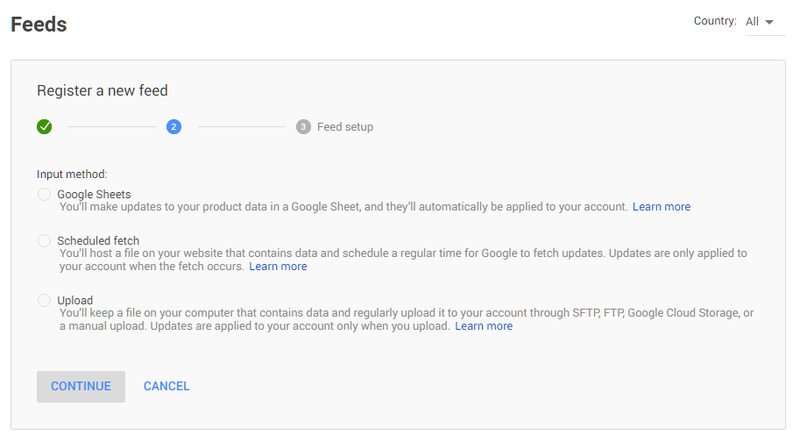 If you want to use Google Sheets or manually upload a text/Excel file with product details, follow the guidelines on this page to format the feed. Google gives you a lot of control over product descriptions, pricing, etc. The Scheduled fetch option is much more convenient. If you tell Google where an updated list of your products is, it will automatically fetch the latest listings. 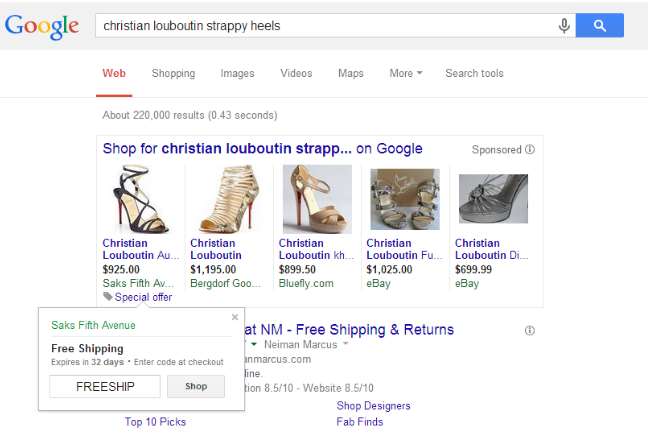 Ecwid users can use this to add their feeds to Google Shopping manually. To do this, log into your store Control Panel, go to All Sales Channels and choose Google Shopping from there. The only thing you must keep in mind here is your product’s identifiers — Brand, GITN and MPN. Once you’ve taken these steps, your products will show up in the Merchant Center. You can now start selling on Google Shopping. Google Shopping listings are entirely paid. If you want your products to show up in search results, you will have to pay for it – like AdWords. In order to start advertising, you will need an AdWords account. 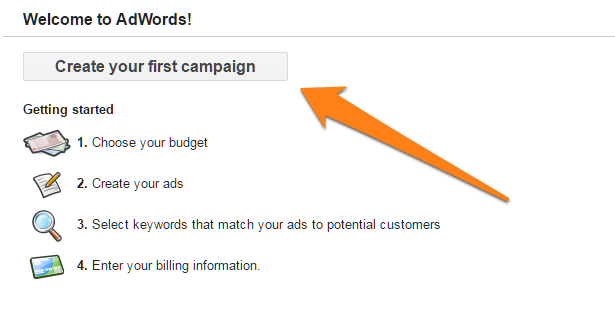 After setting up the account, log into your dashboard and click on Create your first campaign. On the next screen, give your campaign a name and select Shopping under ad type. You will have to connect your Merchant Center account to AdWords before you can start advertising. Follow the instructions on this page to learn how. After linking the two accounts, you can select your placement and optimize your bidding. This is a pretty expansive topic, so start by reading this article to learn how to build keyword lists. Then check out these 5 AdWords tips. Once you’ve selected your products and target keywords, you can start selling on Google Shopping! You’ve now added your products to Google Shopping and even paid for a few ads. But there is still one piece of the puzzle left: optimization. 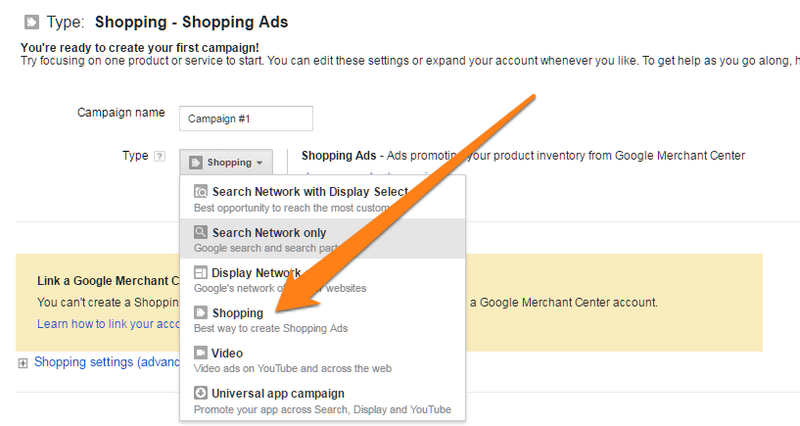 As we mentioned earlier, you can advertise on Google Shopping completely hands-free with Ecwid’s new integration. It includes automated optimization of your ads. That means you’re safe from spending more than you want while getting maximum profit from your ads automatically by adjusting your bids. If you still prefer the manual ad optimization, the further instruction is for you. Optimizing your Google Shopping listing will help you get the most out of your ads. Remember: Google Shopping ads work like any conventional AdWords ad. Your CPC (Cost Per Click) is decided not only by your bid but also by your CTR, ad relevancy, etc. Your listing title is the only source of information shoppers have. Therefore, create titles that inform shoppers more about your product. For example, a customer searching for a specific brand will expect to see brand names in titles. If they don’t, they might skip over your listing. Check out your competitor’s listings to figure out what potential buyers look for. Also, make sure to follow good SEO practice. The general rule of thumb is to place important keywords to the left and less relevant terms to the right. The reason for this is that Google weighs the initial keywords far more heavily. You can see that brand name Patagonia is more important for titles than color. Generally, a good listing format to follow is brand → gender → product → color → size. Only switch up this order when search results aren’t filtered by brand first. Special offers help shoppers distinguish your listing amongst others. They are displayed by simply adding a text at the bottom of your listing to catch your shopper’s eye. Offers tempt users to click-through because they fear missing out on a great deal. Saks Fifth Avenue’s listing probably immediately drew your eye because of the Special offer in bold. You can create an offer for just about anything. For example, free shipping, coupon codes, or contest giveaways (on your site) are all common offers. Remember to add an expiration date on your offers to create a sense of urgency. Reviews have become an integral part of the online shopping experience. In fact, shoppers expect to see them before making a purchase. Adding reviews to your listing is a great way to improve your offer — they serve as social proof right on your listing. Reviews allow you to communicate that your product is high-quality and your service impeccable. This qualitative validation can cause shoppers to select your listing over others. If you were looking to buy a juicer, you’re probably going to click the first listing because it’s the only result with a 5-star rating and has almost 500 reviews to back that claim. In comparison, the other reviews don’t install anywhere near as much confidence. Keep in mind that reviews are only shown on listings from advertisers that share all of their reviews with Google (both good and bad). Check out this page to learn how to get reviews and ratings in your listings. You need a minimum of three reviews to get the rating stars under your listing. Your product images are the first impression shoppers have of your product. For this reason, you need to take time in selecting the right image to impress them. This will be their motivation to click-through to your product. Use white background only. Dark backgrounds, watermarks, and logos just don’t work. Though your product may look amazing in these variations, don’t use them on your listing. If you have to, clip your product image onto a white background. Think diagonally. Google Shopping displays product images in a square frame. Most listings don’t make efficient use of this space by displaying products from a side view. This reduces the level of detail shoppers can gauge about your product. Therefore, present products diagonally. This way you can provide more detail and fill the available space much more efficiently. Check out the difference in detail between a side and diagonal view. Use your own images. Using your own images sets you apart. For one, it will be a welcome change from the sea of stock images many retailers use. More importantly, it lets you flex your creative muscle. For example, you can show a product from a different angle or add post production touch ups that make your product stand out. Inventory ads make it easier for online shoppers to identify which local brick-and-mortar store stocks the product they are looking for online. In other words, local inventory ads direct shoppers to a local store rather than one online. If you have a physical store, this can work wonderfully well for local searches (like Bluetooth speakers in Chicago). Price isn’t always the most important factor in purchase decisions. Your customers also care deeply about your store’s trustworthiness. Trust is the reason why shoppers want information such as testimonials, return policies, and upfront shipping disclosure. Become a trusted store to instantly communicate trust through your listing. Shoppers trust Google’s opinion and their mark of approval is enough to drive shoppers to your store. The badge is displayed right beside your store name. This helps shoppers instantly filter and identify businesses that sell quality products with reliable customer support. Keep in mind that it’s not easy to become a trusted store. To qualify, you need to pass Google’s strict standard of website performance. To pass, you need to meet their expectation for average monthly orders, accuracy in shipping estimation, the presence of an encrypted payment gateway, and customer support quality. To have Google test your site, you need to add two lines of code to your site. Google will then use this code to monitor your site. Follow the instructions here to apply for Trusted Store status. Google Shopping is a powerful way to reach new buyers right when they need you the most. Google’s immense reach and targeting capabilities make it an extremely effective customer acquisition channel. However, achieving the results you expect will take time, patience, and hard work (unless you choose to automate Google Shopping). Make sure to follow Google’s set guidelines and optimize your listings and you’ll soon have shoppers flooding to your store ready to buy.